Air pollution and its control, major sources of gaseous and particulate pollutants, control devices such as scrubbers and electrostatic precipitators. --Water pollution- major sources and its control. Eutrophication, BOD. --Soil pollution- sources, effects and control. Agrochemicals and their effects, bio-magnification and bioconcentration. —Deforestation, green house effect, global warming, impact on organisms due to climatic changes, ozone depletion. —Three case studies as success stories of environmental issues. POLLUTION is introduction of any type of contaminant into the environment. Pollution is mostly by human actions, but can also be a result of natural disasters. Substances that cause pollution are called as pollutants. These can be substance, such as chemicals or waste products, that renders the air, soil, water, or other natural resource contaminated or harmful. Air pollution is the accumulation of hazardous substances into the atmosphere that danger human life and other living matter. The WHO describes air pollution as presence of foreign particles, gases etc in the air that adversely affect living organisms, buildings, other structures etc. It may result in reduced growth and yield in plants and various disorders in animals. Air pollution is mainly in the form of gaseous pollutants or particulate pollutants. 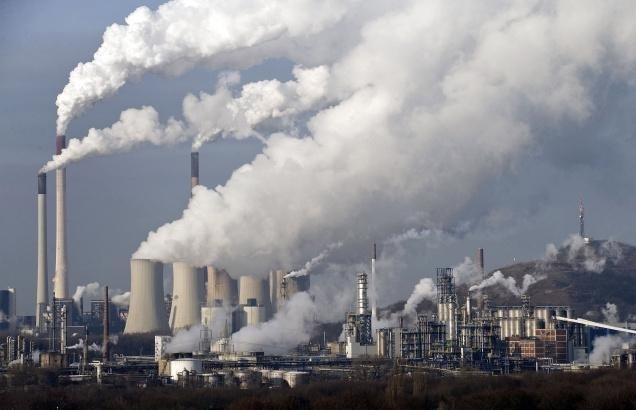 industries, homes, hotels, bakeries, thermal plants and brick kilns use fossil fuels that contributes gaseous and particulate pollutants in the air. Burning of fossil fuels lead to forming smoke, soot, fly ash and dust in the air. These pollutants from automobiles, aircrafts, locomotives, etc. Gaseous pollutants that contain: CO(77.2%), nitrogen oxides (7.1%) and hydrocarbons (13.7%) and small amounts of SO2, NH3 and lead. Particulate Lead: The major source of lead pollution is leaded petrol having, Pb(C2H5)4, Pb(CH3)4. When absorbed in the body, lead inhibits haemoglobin formation. Aerosols are emitted into the air in the form of vapour or fine mist. Jet aeroplanes emit aerosols containing chiorofluorocarbons (CC12F2 and CC13F). The aerosols deplete ozone layer in the atmosphere. 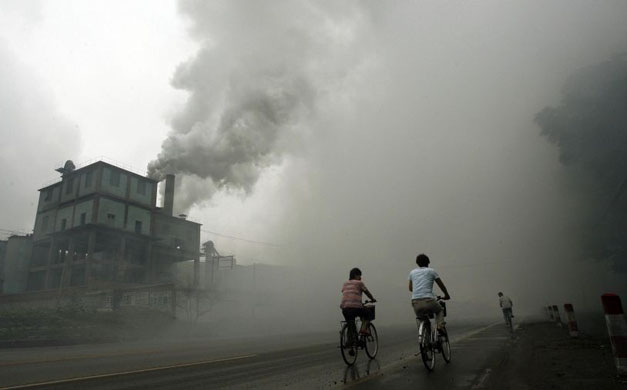 Bikers ride through horrific industrial pollution in China. 3. Industrial Processes: Industrial processes include metallurgical processing, welding, grinding, synthesis of chemicals, petroleum refineries, fertilizer plants, paper and pulp factories etc. These processes release several particulate and gaseous pollutants into the air. Gaseous pollutants released from industrial processes include oxides of carbon, sulphur and nitrogen, fluorides and vapours of several compounds. Compounds containing chlorine and flourine such as chlorofluoromethane, which are widely used as propellants for aerosols, cans and refrigerants. Particulate matter released from industries include metal dust, fly ash, soot, cotton dust and radioactive substances. A number of harmful trace metals such as antimony, lead, mercury, nickel, cadmium, chromium, etc. are present in the metal dust. A number of poisonous gases are also released accidentally from industries. Accidental release of phosgene and methyl isocynate (CH3NCO) from Union Carbide Factory in Bhopal on December, 1984, killed more than thousands of person and maimed several thousand persons. Tobacco smoke contains benzopyrene and a number of other hydrocarbons. It is a potent pollutant in cinema halls, auditorium, buses and trains. Processing and burning of plastics produce polychiorinated biphenyls (PCBs). They enter the human body through food chain, damage the liver and impair vision. Pollens, spores and microbes present in the air cause allergies and other respiratory problems. 4. 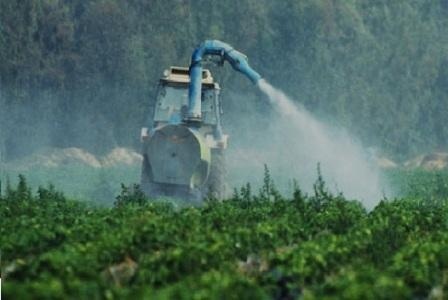 Agricultural Activities: A large number of gaseous and particulate pollutants are released during agricultural buming, spraying of pesticide and weeclicides. Natural sources- these include spores, pollen grains, dust, volcanic fumes etc. Anthropogenic sources- These include soot, smoke, fly ash, dust (from cotton mills, mining operations, flour mills etc). Larger particles (>10um) settle in a day, however the smaller ones remain suspended for long periods depending upon the size of particles and conditions in the atmosphere. These are called suspended particulate matter (SPM). GASEOUS POLLUTANTS-These are carbon monoxide, carbon dioxide, nitrogen oxides, hydrogen suiphide, sulphur dioxide, hydrogen fluoride, hydrocarbons, industrial accidental release, aerosols and tobacco smoke. Carbon dioxide: CO2 content of air has increased by 15 per cent during the last 100 years. A jet plane in .a single trip across the Atlantic uses 35 tonnes of 02 and releases 70 tonnes of CO2. Carbon dioxide causes nausea and headache. As CO2 accumulates in the air, it absorbs more and more infrared radiation. It may cause greenhouse effect, raising the atmospheric temperature. 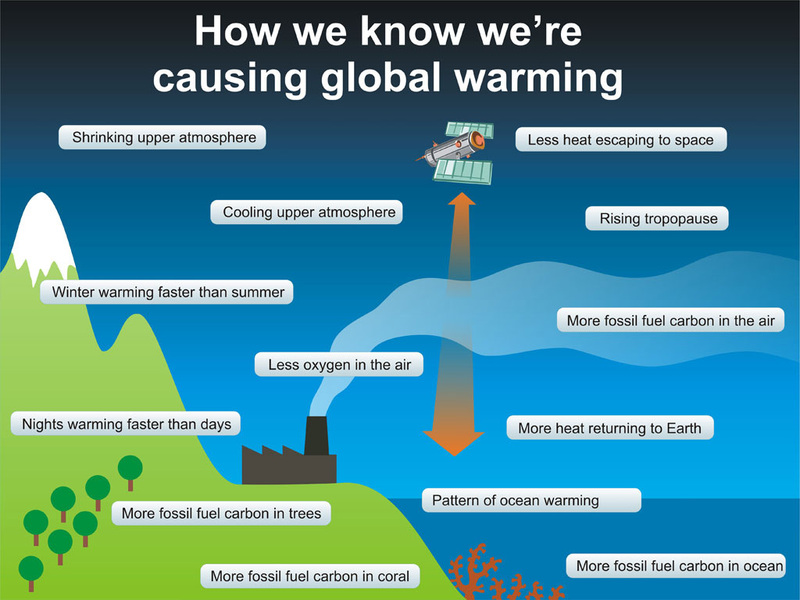 This causes melting of polar ice, rise in the level of oceans and flooding of coastal regions. Carbon Monoxide: It is a very poisonous gas. it is produced by incomplete combustion of fuel in industries, motor vehicles, kitchens, smoking, etc. If inhaled, it combines with haemoglobin and reduces its oxygen-carrying capacity. This leads to laziness, reduced vision and death. Oxides of Sulphur: These are sulphur dioxide and sulphur trioxide. These are produc* by the burning of coal and petroleum in industries, thermal power plants, automobiles, motw vehicles and during smelting of metallic ores (e.g., iron, lead, zinc, nickel, copper, etc.). In air SO2 and SO3 combine with water vapours to form sulphurous acid (H2S03) and sulphuric act (1-12504) respectively. Fluorides: Hydrogen fluoride and other volaffle fluorides are hazardous pollutants even when present in concentrations of 0.001 ppm by volume. Fluorides are liberated mainly from aluminium smelting, steel and phosphate fertiliser manufacturing industries. These are also released during burning of coal. Hydrogen Suiphide: It is a highly toxic and corrosive gas having a rotten-egg odour. It is produced from natural sources such as swamps and bogs as well as from human sources such as petroleum refining and metal smelting. Hydrocarbons (HCs) and Volatile Organic Carbons (VOCs): These are organic compounds which are composed of carbon and hydrogen. Over 80 per cent of the hydrocarbons are emitted from natural resources. It is also formed by incomplete, combustion of fuel in automobiles, homes and by evaporation of organic solvents, and bacterial decomposition of organic matter. Methane is the most abundant hydrocarbon, followed by ethane. Methane is emitted by paddy fields, cattle and swamps. It is a greenhouse gas which is oxidised in the atmosphere to CO2. (a) CO combines with haemoglobin and reduces oxygen-carrying capacity of blood. (b) Nitrogen Oxides irritate the respiratory tract. (c) Polycyclic Hydrocarbons: Seven types of polycyclic hydrocarbons are found in tobacco smoke. Of them, benzpyrene is highly carcinogenic. Tobacco smoke also harms nonsmokers (called passive smokers sharing the same place). Smoking increases the risk of lung diseases by six times, lung cancer by 10 times and heart diseases by two times. Smoking also causes tanning of teeth and fingers, smokers cough, male impotency and birth of deformed children in smoking mothers. It is formed photochemically from unsaturated hydrocarbons and nitrogen oxides. Both are released by automobile exhausts. The oxides of nitrogen, in the presence of sunlight, react with hydrocarbons to produce peroxyacetyl nitrate (PAN), ozone, aldehydes and other compounds. Secondary pollutants are formed under warm conditions in congested metropolitan cities and transport areas in the presence of intense solar radiation. 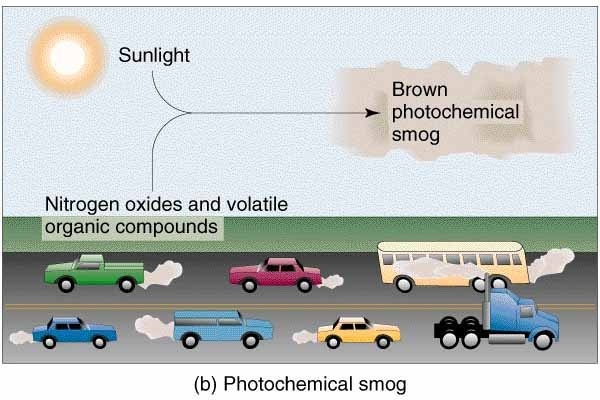 Photochemical smog is often called brown air, where solar radiation is intense. In regions of lesser solar radiation, smog formation is incomplete and the air is called grey air. (a) It causes eye irritation and respiratory distress. (b) Spongy parenchyma of young leaves is destroyed. Other leaves also show silvering, glazing and necrosis. (c) Due to the damage of chioroplasts, photosynthetic activity and growth are retarded. (d) Cellular metabolism is affected due to interference with enzyme systems. (a) In low concentrations, it causes chest pain, coughing and eye irritation. (b) High concentration of ozone is fatal to both animals and plants. In plants, it causes premature yellowing and fall of leaves. (c) Ozone causes discolouring and disintegration of clothes. c. Aldehydes: These produce irritation in the respiratory and gastro-intestinal tracts. d. Phenols: These damagespleen, kidneys,liver and lungs. It is precipitation or rainfall of acidic chemicals from atmosphere on the earth. There are two types of deposition— wet and dry deposition. 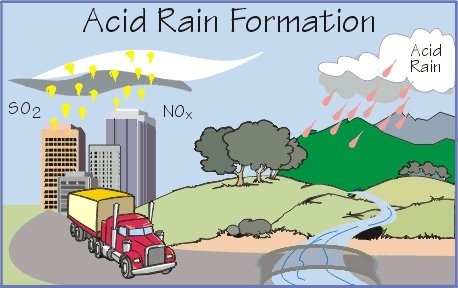 Acidic water received through rain, fog and snow is called wet deposition. The wind blown acidic gases and particles in the atmosphere which settle down on the ground are called dry deposition. About half of the acidity in the atmosphere is transferred to the earth through dry deposition. Dry deposition over trees and exposed surfaces is washed down by rainfall. Wet deposition is acidic water received in fog, snow and rain. Normally, rainwater is slightly acidic because of CO2 that forms weak acid (pH 5.6—6.5) in rainwater. The pH of acid rain is less than 5 or even as low as 4. Oxides of nitrogen (NOr), volatile organic carbons (VOCs) and SO2 are produced during the combustion of coal (in thermal power plants and industries) and petroleum (in automobiles). Lightning in sky also produces NON. SO2 and oxides of nitrogen are rapidly oxidised to sulphuric acid or nitric acid respectively, which are quickly washed down to the ground as acid rain. a. Selection of suitable fluid- Fuel with low sulphur content should be used in industries. b. Reduction in emissions- modification in processes and equipments to reduce emissions. c. chimneys and smoke stacks- Very tall and placed at higher level. d. Establishment of industries- Industries should be away from residential areas. Arresters and Srubbers are devices used to remove particulate air pollutants. There are different types of arresters. The electrostatic precipitators are devices that remove more than 99 percent particulate matter from the exhaust of thermal power plants smelters and other industries. Scrubbers are used to clean dust and gases in the air by passing it through a dry or wet packing material. The ESP works on the principle of electric charging of the dust particles and collecting them on a differently charged platform. it has electrode wires that are maintained at several thousand volts, that produce a corona releasing electrodes. These electrodes attach to the dust particles giving them a net negative charge. Collecting plates are grounded and attract the changed dust particles. The velocity of air between the plates is kept low enough to allow the dust to fall. In this the exhaust is passed through a spray. Scrubbers are best suited for the removal of gaseous pollutants like sulphur di oxide. Water pollution is the introduction of chemical, biological and physical matter into large bodies of water that degrade the quality of life that lives in it and consumes it. Agricultural Runoff: It is the surface runoff from agricultural fields. The runoff carries fertilisers, pesticides, silt and agricultural wastes. 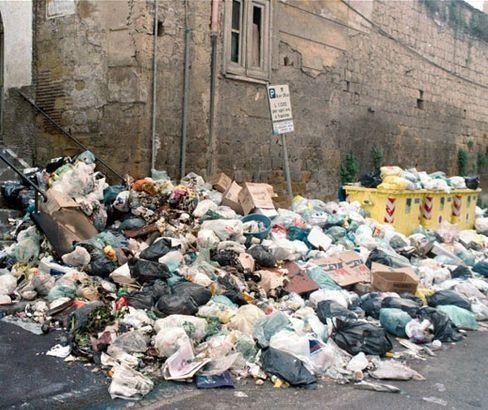 It carries storm water, wastes from buildings, streets, roads, garbages, eateries, commercial areas, etc. Since non-point source of pollution occurs over a large area, large scale control measures are required but these are difficult to implement. 1. Biological Pollutants: These include pathogens like viruses, bacteria, protozoa, algae and worms brought in waterbodies with domestic sewage and municipal waste water. Cyanobacteria produce toxins in water. 2. Chemical Pollutants: These include both organic and inorganic chemicals from industrial effluents and agriculture sources. Organic chemicals include pesticides (biocides), dyes, paints and organic wastes. Inorganic chemicals include heavy metals like Ni, As, Pb, Cd, Hg and salts like nitrates, suiphates, suiphides and fluorides. 3. Physical Pollutants: These include hot water, oil spills, oil wastes and hot industrial effluents. 1. Algal genus index- Presence of algal genera in the water body - more than 20 genera indicates high level of pollution, less than 5 genera indicates clean water. 2. 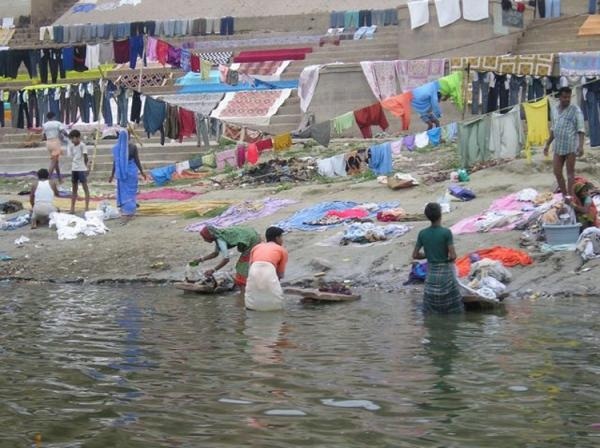 Biotic index- water body with biotic index more than 15 is clean whereas less than 10 indicates highly polluted water. 3. 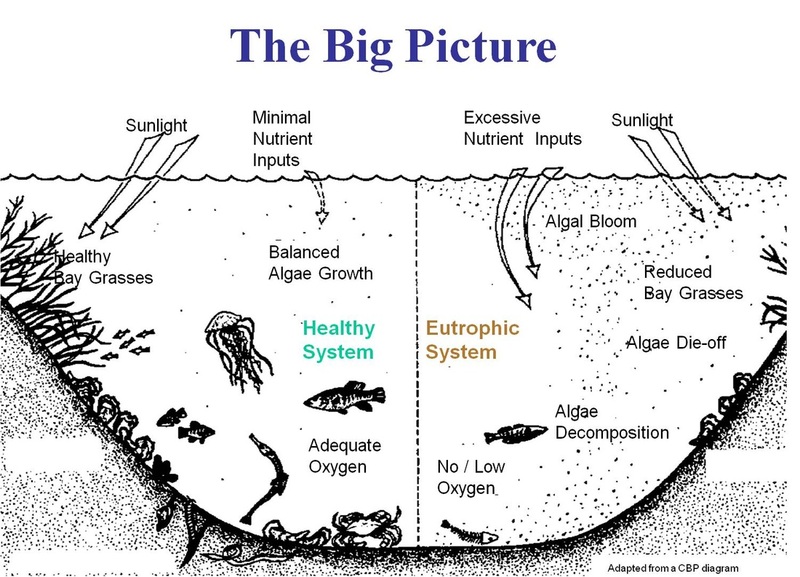 Biological oxygen demand (BOD)- The amount of dissolved oxygen in a waterbody needed by aerobic decomposers to break down certain volume of water at 20 degree Celsius over a period of five days. More the BOD more organic content present in the water body. Pollutants can enter a food chain and increase in concentration of organisms as they move from one trophic level to the next. This results in Bio- accumulation and bio- magnification. Biomagnification: Increase in concentration of a pollutant from one link in a food chain to another. A pollutant that is short-lived, is broken down before it can become dangerous. If it is not mobile, it will stay in one place and is unlikely to be taken up by organisms. If the pollutant is soluble in water it will be excreted by the organism. Pollutants that dissolve in fats, however, may be retained for a long time. Normally pollutant levels are checked by measuring the amount of pollutants in fatty tissues of organisms such as fishes. In mammals,the milk produced by females is tested, since the milk has a lot of fat in it and because the very young are often more susceptible to damage from toxins. The substances that biomagnify are- DDT, PCB (poly chlorinated biphenyls), PAH (Polynuclear aromatic hydrocarbons), heavy metals like mercury, cadmium, zinc, lead etc. 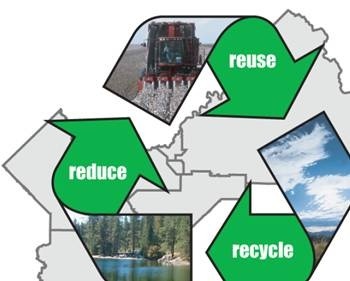 All types of electrical and electronic equipment (EEE) that has or could enter the waste stream is called as E-mwaste. E-waste covers TVs, computers, mobile phones, white goods (e.g. fridges, washing machines, dryers etc), home entertainment and stereo systems, toys, toasters, kettles – almost any household or business item with circuitry or electrical components with power or battery supply. Electrical goods contain a range of other toxic substances such as lead (Pb), beryllium (Be), brominated flame retardants and polychlorinated biphenyls(PCB) just to name a few. Deforestation in some states has remained a serious concern, according to the the Environment Ministry's India forest report. 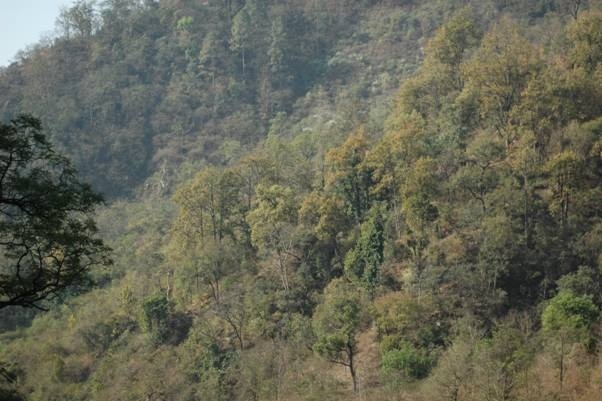 The report says India's forest cover is down by 367 square kilometre as compared to the last survey in 2009. This came despite the fact that 15 states have increased their forest cover in this period. The forest cover in 12 states has decreased considerably. The maximum loss of forest cover has happened in Andhra Pradesh.Nagaland and Manipur have also lost large tracts of forests. 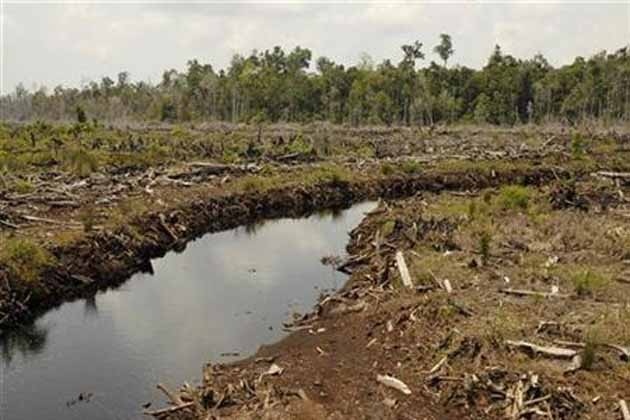 However, the report is silent on how much deforestation has occurred due to large development projects. 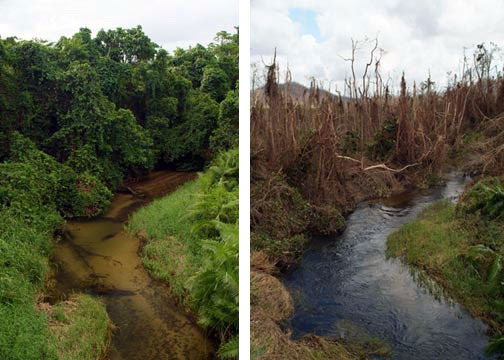 These images are of Maria Creek in Queensland, Australia, before and after cyclone Larry hit. Even down in the low-lying river bank the wind blew all the leaves off the trees. Many studies have shown that the frequency and intensity of cyclones and other storms are supposed to increase as global temperatures rise. A unique form of protest organised by the rural people of Himalayan region against indiscriminate logging and felling of trees. The villagers embraced the trees to stop them from being felled by the contractors. This gave the name 'chipko movement'. The movement first occurred in April 1973. It then spread to several hill districts in Uttar Pradesh. In 1980, Chipko activists won a fifteen-year ban on green felling in the Himalayan forests. The movement has also succeeded in stopping the felling of trees in the Western Ghats and the Vindhyas. Spurred by its victories, the Chipko Movement spread to Himachal Pradesh, Kamataka, Rajasthan, Bihar and to the Vindhyas in Central India. A remarkable people’s movement saved a pristine moist evergreen forest in Kerala’s Palakkad District from being destroyed by a hydroelectric project. The battle for the now famous Silent Valley raged for over ten years and involved thousands of people who did not even live in the vicinity of the area that was to be destroyed. Although the campaign did not have any centralized planning, it was highly effective. The sustained pressure exerted on the government by citizens using every possible means available at the time – letters to the editors of newspapers, seminars, widespread awareness programmes, and finally petitions and appeals in court and other high offices – proved ultimately successful. 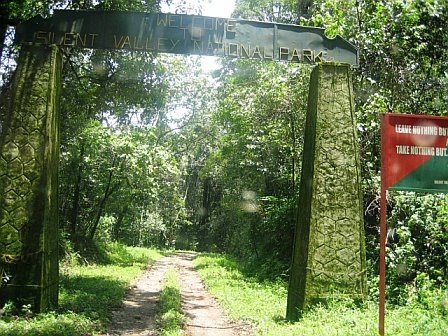 In 1986 Silent Valley was declared a National Park, a striking testimony to the power of peoples’ action. The ‘Save Silent Valley’ movement is one of the most hard-fought environmental victories in India. It brought together people from all walks of life in a struggle against a hydroelectric project that would have submerged 830 hectares of rain forests.